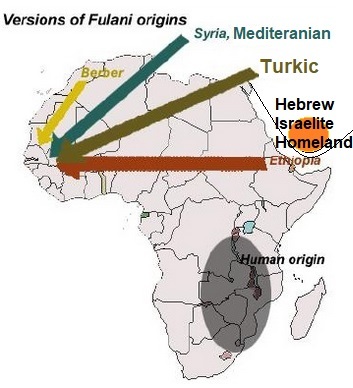 A very important and interesting possible link to the origins of Fulani could be deducted from an article titled “The Israelite in Sudan and the Jews in the land of the Mahdi” It could suggest that earlier Fulani were Hebrew Israelite from Arab Yemeni ancestry who slowly moved from Ethiopia and the Sudan to North Africa before going south to raid and enslave West Africans. The sudden massive waves of people fleeing their collapsed countries in 1300 BC in the Mediterranean Sea, who are known as “the Sea People” also invaded the Levant, Egypt, and the rest of North Africa. These groups could had added further pressures and complexity that faced the indigenous Amazeigh and the Hebrew Israelite bandits of slavery.